We can think of blind faith in two ways. First, skeptics like to picture blind faith as believing something foolish or illogical. To them it is like the man who was asked if he really believed that a whale swallowed Jonah to which he replied, "Yes, and if the Bible said Jonah swallowed the whale I would believe it too." He becomes a depiction of the faith definitions of Christians. But is that really fair? Let's look at the story of Jonah more closely. First, the Bible never says that a whale swallowed Jonah. The Biblical record states that "the Lord had prepared a great fish to swallow up Jonah." [Jonah 1:17]. The atheist/skeptic is likely to laugh and say no fish could swallow a man whole. And based on his presuppositions he would probably be correct. [Although if he is honest he should say that no fish exists today that could do it. There is no way anyone could know all the possible types of fish which have existed throughout earth's history.] The atheist begins on the unprovable assumption that God does not exist. IF his assumption or presupposition is correct, then his conclusion that the record of Jonah is false is also likely to be correct. The Christian starts with the assumption or presupposition that God does exist and there is a supernatural element to life. Looking at the record from that perspective, we find the story does make logical sense. The record states that God "prepared" a great fish. This implies that a living fish was altered for this specific job or else a special fish was created for the job. Considering that God created the entire universe, there is nothing unlikely or illogical in this story. Now about the statement that "if the Bible said Jonah swallowed the whale..." This is indeed a foolish statement from any perspective. While the Bible states things which go beyond natural understanding or reasoning, it does not degenerate into childish, illogical statements. The Bible would never say anything like that, so it is a non-issue. Notice, in the above example, both the atheist and the Christian based their conclusions on faith. Neither one could prove their presupposition. They both had to start with a faith assumption and then work to a conclusion. Once they accepted their presupposition by faith they could then work logically to their conclusion. They reached opposite conclusions because they started with opposite presuppositions. Obviously, one presupposition is right and one is wrong. 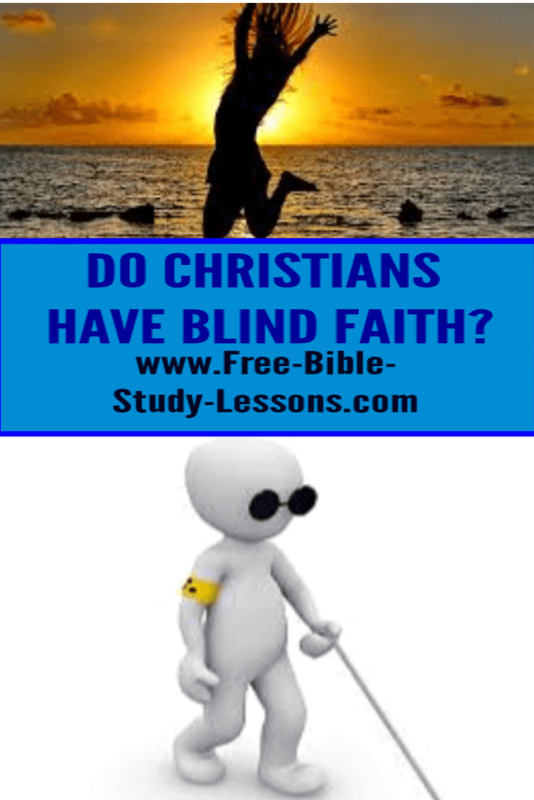 So if blind faith, according to this first definition, is believing something foolish or illogical then we have to conclude that Christians do not have blind faith. Both Christians AND non-Christians have to begin with faith assumptions. These assumptions or presuppositions cannot be proved by science, they are simply accepted or assumed to be true. Given the Christian presupposition, all the teachings of the Bible follow logically. How does a person test to know if they have the correct presuppositions or not? A person tests his presuppositions against known facts [Rom. 1:20]. [It it vital to test it against the fact NOT the conclusion drawn from the fact which is already coloured by the underlying assumption.] Do the known facts support the underlying assumption or do they argue against it? If there seems to be a conflict the next step is to determine if the conflict is with the conclusions drawn from the presuppositions or is it with the presuppositions themselves? It is possible that the presupposition is correct, but we have drawn wrong conclusions from it. There will always be an element of faith because we will never have all the facts or perfect information. Considering all of this, who really has blind faith the Christian or the atheist? Given the Christian presupposition, there is nothing in the natural world which would contradict the assumptions made and much to support them. The more science discovers of the complexity of the universe and life itself, the more it points to a Designer. To support his presuppositions, the atheist most come up with an explanation of how a complex universe came into existence. Most often they turn to some variation of the hypothesis of evolution. Evolution's goo-to-you ideas go against both science and common sense and have many gaps which must be filled in with faith assumptions. It is actually the atheist evolutionist who has blind faith. The religious fury with which they try to exclude or persecute all rival ideas indicates a lack of confidence in their own faith assumptions. Second, if we define blind faith as simply believing something someone cannot prove or could never be proven/disproved, then every human being operates on blind faith. All our lives are based on assumptions that are always in the stages of being confirmed or disproved. Christians can stand firm in the faith. They have nothing to be ashamed or embarrassed about.